This holiday, I think the focus should be on shine...or shall I say, BLING BLING. You want to be able to stand out within the crowd and really sparkle. One quick and easy way to shine this holiday is play up your nails. You can play up your nail color this holiday and really have fun. So I'm sure you fashionistas may be wondering, "So...nail color...okay, but WHAT color?" I definitely have a few favorites to share with you. This holiday I really feel that the following colors are HOT: ruby red, glittery gold and silver. All three of these colors are eye catching and not only that, go with any skin tone. Now to make it even better, I've found a kit that has all three colors [along with three others] inside it! I found this little set a few weeks ago while I was in Sephora. I was searching for the popular new nail color called "Looks Like Rain Dear" [glittery gold] when I learned they were sold out at the time. They showed me this mini collection instead and trust me, this was a better investment. As I listed below, this set is $22. These are mini bottles, but honestly, you only use a small portion of the nail polish when you use it so these would last you for awhile. 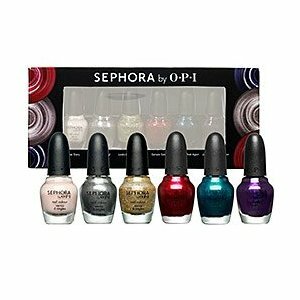 Also, this collection is by Opi which is a very popular nail polish brand that is found in literally every nail salon. This is good quality stuff people! Apply two coats of desired nail color. Finish by applying TWO coats of Sally Hansen's Insta-Dri Anti-Chip Top Coat. I honestly live by the Insta-Dri top coat. Once you apply the second coat, your nails should be dry. Also, with a good top coat, your nail color can last up to a week. Sounds just like getting a professional manicure huh? Wondering Where To Find These Items? Sally Hansen's Insta-Dri Anti-Chip Top Coat -- Any drug store! If you have any comments or questions, please comment me! Thanks & God Bless! I never thought about two coats of a top coat...I'm going to try that.